Simple, attractive & good quality! 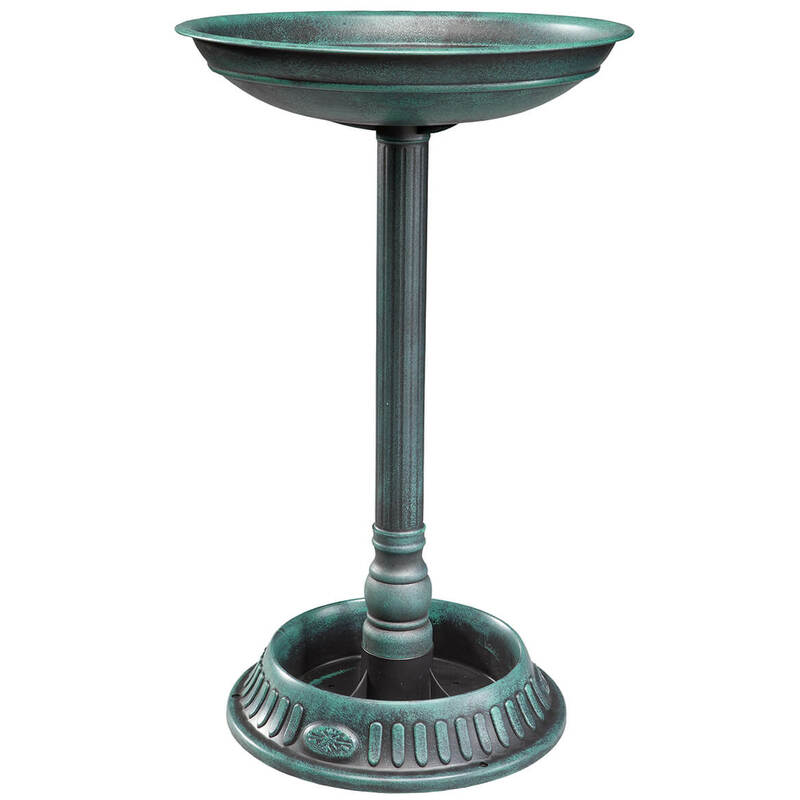 This birdbath is made of very heavy duty plastic that looks like bronze or copper with a patina (green hue). It comes in 4 sections that screw together easily. It takes just a couple of minutes to put it together and set it up. It has stakes to secure it to the ground, and I added some rocks in the base for now. I will probably plant something in the base when the weather warms up a bit. Great bird bath. I bought one for myself and sent my sister one. She loved it. We both love birds. Looks great... Will look even better once the weather warms up & flowers can be planted in the base. I purchased this bird bath to put in my back yard for the humming birds. I have a concrete my husband made for Mother's Day many years ago. The larger birds and squirrels chased the hummers away. Now they have their own. I put some river stone in the bottom and it looks great any stays put. Replacing birdbaths. These fit right in to a natural atmosphere. Really like the look, filling with rocks instead of flowers. I have a large covered front porch that runs across the entire front of my large home and I have many hummingbird feeders hung on that porch and also around the outside of my entire house, plus I have seed bird feeders & suet block holders placed all around my yard. I have a large amount of birds living here. My dog and my Indian Ringneck Parrots like to watch the humming birds on the front porch through the big picture windows so I bought the lightweight inexpensive bird bath to use on the front porch for all our added bird viewing pleasure. I used heavy decorative craft stones in the bottom planter to weight it down and that worked exceptionally well. Every piece was intact and not warped nor was anything else wrong with them when the bird bath arrived. It was super easy to put together and is easy to clean. I have a big heavy bird bath in the back yard but just wanted something easy to put away for the winter for the front porch so that all of my family and our pets would have more to view on the front porch re bird watching. I kept the box this bird bath came in to use for winter storage. It doesn't take up much room when storing it and I'm very happy I bought this item. I have a flat stone with an interesting shape that I place in the center for the birds to stand on. This is a great birdbath. It was very easy to assemble. Nice quality. Birds came to it right away. I added this bird bath/flower planter to an existing bird bath along the side of my yard. It looks great and the petunias I planted in its' base are doing good. The birds like it, I like it, it was reasonably priced...a three way winner. Good for the price. Looks nice in the garden although no birds have visited it yet. Don't really use the bottom planter. I put rocks in there to make sure it's held down. Comes with stakes but I like the extra security of the weight. Whenever I water my garden the birds come around and start singing a racket! I thought they might like a place to drink! Pleased with the one I ordered before, decided I needed two! I had this birdbath and ended up giving it to my neighbor. Why? I'll never know! I needed another for my massive bird collection, so I ordered another. I want the birds to have a cooling off place, a drink of water, and a bath if they so desire!! Need decor for front lawn. Thought planter added to just a plain bird bath. We have an old cement bird bath, this looks like a good replacement, and the good reviews helped me to pick this. Also it would be lighter to move around than the cement one. 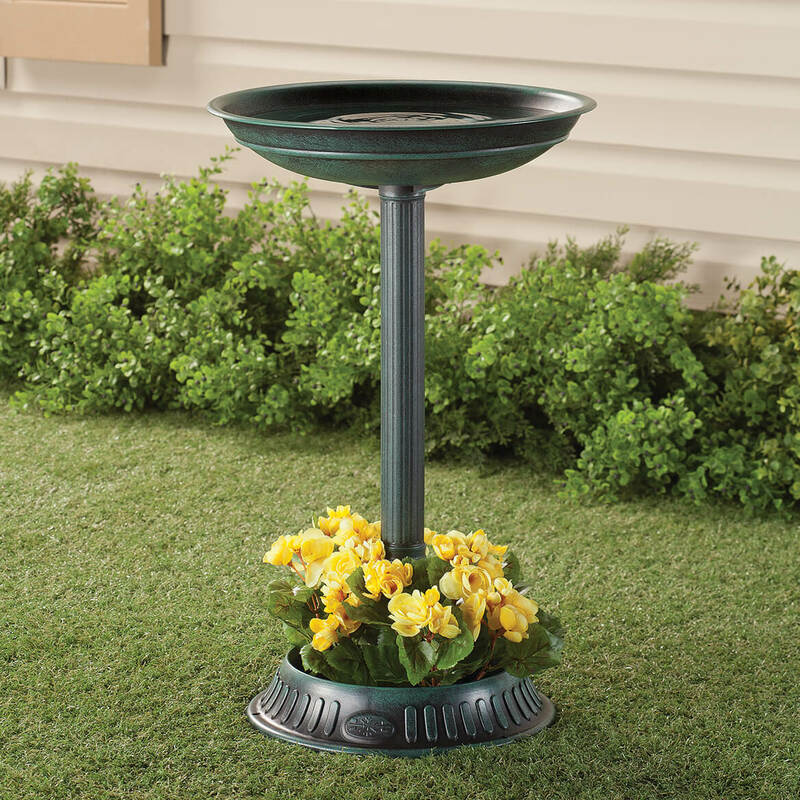 This bird bath had great reviews and fantastic price! I really liked the color and style. The price was excellent and the reviews were all great. For use in all weather - need this for the birds in the winter. The birds are always seeking seed and water since they are used to me providing it. This is a nice addition to my garden. It's light too so portable. My cats wanted one to drink out of after I bought one for my birds. I purchased one last year and really liked it. Decided to place another one in my back yard too. Nice looking, priced well, stability rods instead of having to add sand or rocks to base. Reasonably priced for rental property. Looked good and had good reviews. Perfect for our Garden Club raffle ! Adding to my Back Yard Bird Sanctuary! I purchased one of these birdbaths at the beginning of Summer. I am so pleased with the product, the price, and the fast delivery... I ordered 2 more! The birds and the deer will be happy!! May be what I'm looking for. I've been wanting a birdfeeder, it looks nice, so I thought I would try it. I'd like to know if anyone has trouble with this birdbath being tipped over by animals such as opossums or cats? I've had a cement one for years and the saucer is often tipped over by raccoons. Last week one was killed by the saucer landing on it. BEST ANSWER: Ground stakes are included with the birdbath to add stability. Because our yare was slightly off level, we used the stakes to level our birdbath. We have a yard full of squirrels that love to sit of top of top of the birdbath all the time without incident. Just to be sure, I walked out into the yard ad shook the birdbath. It was very sturdy.. I have mine securely into the ground with the stakes and I also have large rocks in and around the base. The top does come off, however, I haven't had larger than squirrels trying to get in and drink. I would think a larger animal would knock this over, because the top comes off. I have not had any problems with this birdbath tiping over. It's been great to have. I made sure it was level, use the stakes and put flowers in the bottom of you wish. I didn't do it since it was easier to clean. I highly recommend it. Mine can be knocked off center but the top does not come off so it is no danger to animals. I just need to straighten it sometimes. I have used different things to try to anchor it better but, so far, to no avail. Hi we don't have racoons here plus racoon are pretty strong animals so this birdbath will fall.I placed mines on ground grass and pin it with what it bought. It has not fallen. As long as you put the stakes in the ground, it's pretty steady. I added a few rocks too. I have had squirrels jump on it and it doesn't move. We put decorative rocks in ours and it stays very stable. Cleans up really nice also. Does the Planter at the bottom have holes in the bottom of it? BEST ANSWER: No. It would be very easy to put holes with a drill. However, it is shallow. I personally wouldn't try to grow plants in it. Some artificial plants would be my choice. For the price,it is very nice looking. Yes, the planter on the bottom has a couple of holes for drainage. Yes, there are holes to secure it to the ground. Yes, it had 3 holes for drainage. Must I use the stakes? I want to put it on a deck. BEST ANSWER: It helps to use the stakes if it is being used outside om grass or soil, because the stakes prevent tipping over. For use on a deck or another solid, flat surface, I suggest using some type of weights in the base so that it will not fall. I hope this helps! No. Strictly for stability. Wind could tip it if it was strong enough. Maybe the soil in the base would weigh it down. The stakes are removable. I have stones in the planter portion of the unit to keep it from falling over. How much water does it take to fill this bird bath? BEST ANSWER: I usually put 2 to 3 inches of water in this bird bath. I put fresh water in everyday. All the birds like to take their bath, but, I have noticed the young ones aren't able to get out if there is too much water In the bath. About a gallon of water fills this. BEST ANSWER: Thank you for your question. The birdbath is 3" deep. We hope this information will be of help to you.